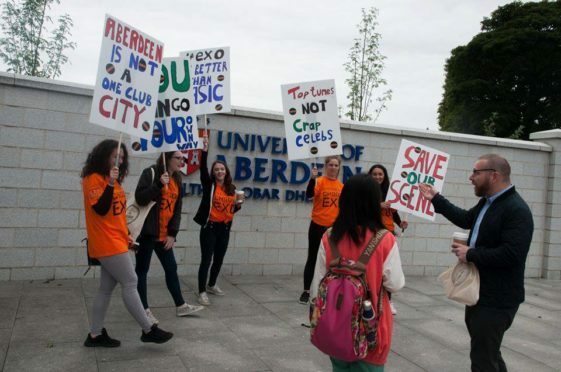 Nightclub staff protesting at Aberdeen University. Police were called to Aberdeen University as bar staff protested a decision to allow only one nightclub to promote itself to fresher students during a fair. The university’s students’ union has signed an exclusive deal with the Atik nightclub, which has left managers at other city nightspots unable to advertise their businesses to the thousands of first year students arriving in the city. Staff from Exodus, on Schoolhill, instead chose to market the venue with a “tongue in cheek” demonstration at the university on Tuesday afternoon. But Aberdeen University called the police after it was claimed a team of promotional staff from another city night venue took the disruption too far on the High Street. It is understood there were complaints of water pistols being used on representatives from Atik. A police spokeswoman confirmed that officers were called to deal with a complaint of “threatening and abusive behaviour”, but it is believed the alleged offence was “at the lower end of the scale”. Exodus manager, Michael McMillan, explained the new rules which have sparked fury across the city’s nightclub trade. He said the bar had paid £600 per day in previous years to attend the “freshers fayre” – but had been told they were banned this time because of the arrangement with Atik. Mr McMillan added: “We were told we could mention our adjoining pub, Triplekirks, but if we promoted the nightclub Exodus we would be escorted from the grounds. Aberdeen University Students’ Association organises the event, and argued that Atik had been chosen as it appeared to offer the best value. A spokesman said: “We entered into a partnership with Atik during freshers’ week as it was felt that it represented the best value for students. “We have experienced a good relationship with this venue. An Atik spokeswoman said the deal was “testament to the quality and reputation of the venue”. An Aberdeen University spokesman confirmed that police were called at about 1pm on Tuesday after “concerns” were reported about the behaviour of some “promotional staff”.